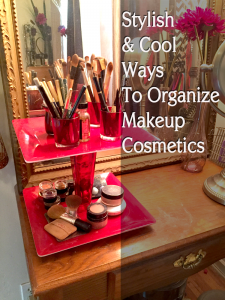 Want to get rid of the stuff you don’t want and make yourself a superstar friend at the same time? Then maybe try re-gifting your stuff. Also, when you need a gift, there’s also the factor that you may have neglected to go shopping for that birthday gift. 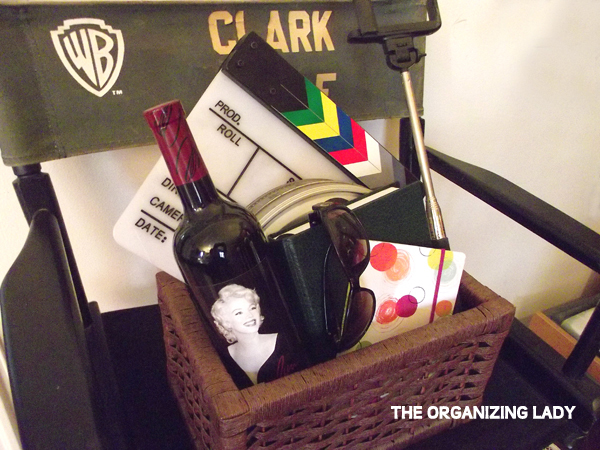 Or maybe you’d like to bring something with you for the host at a dinner party. Whatever the occasion, you just need a last minute gift. 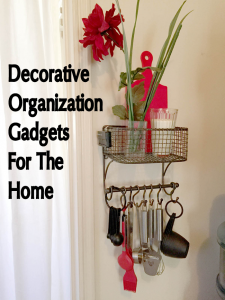 You can personalize a gift to someone special by adding something that you know they would like or use. 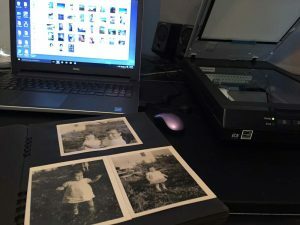 There are probably many things around your house you have tucked away, or that you purchased at the grocery store that could be included in a gift basket. A bar of soap, for example, is not a gift by itself, but mixed in with other items can make a splendid gift mixture. 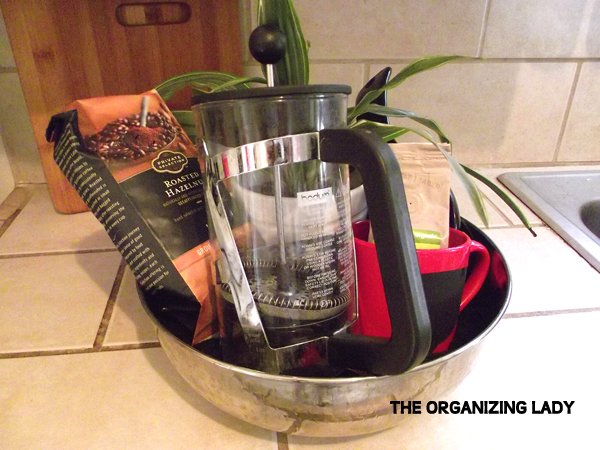 I simply gathered up some kitchen items I had excess of (like cooking utensils, measuring cups, kitchen towels, etc.) 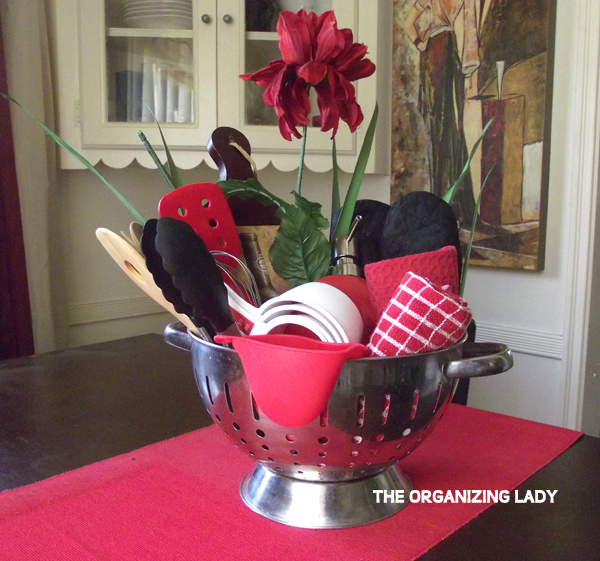 and displayed them in a stainless steal colander. To give it lift, I crunched up a red kitchen hand towel inside. Oh, this was fun since I’m a coffee lover myself! 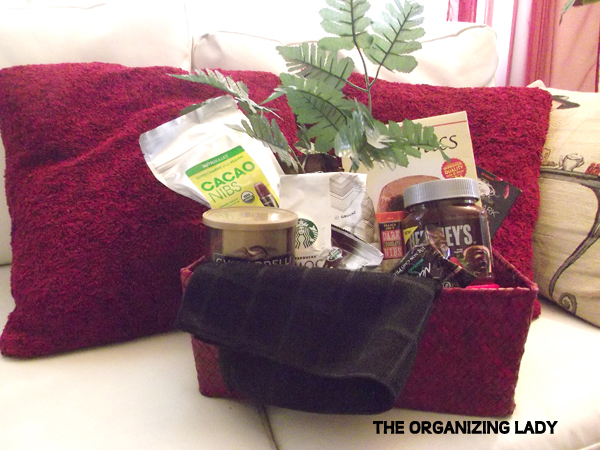 Using one of my old mixing bowls, I stuffed bags of coffee, an extra French Coffee Press that was gifted to me, and a coffee mug inside and was able to create this basket. 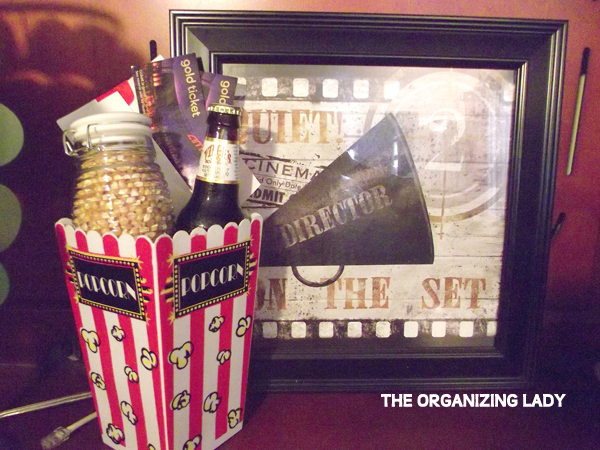 Too simple for words – a dollar store popcorn container was my holder for a jar of popcorn, a bottle of root beer, and 2 movie tickets. If I had a big popcorn bowl container, I would have been able to stuff more inside! My house has no shortage of chocolate, so I threw a bunch of stuff in this basket – chocolate cocoa, chocolate syrup, chocolate coffee, chocolate cake mix, cacao nibs, and some bars of chocolate bars. 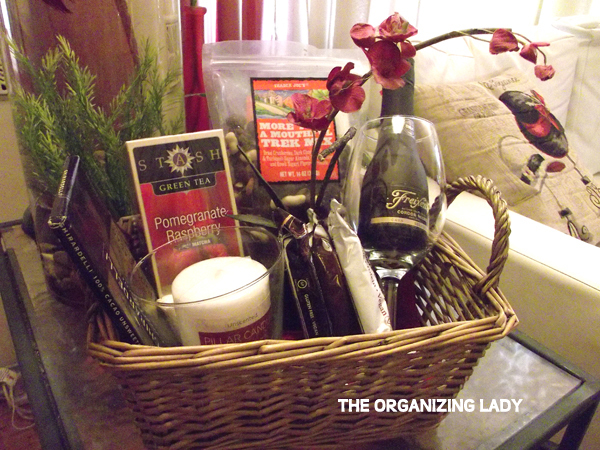 Anything goes for this type of gift basket, so I put a wine glass inside with a small bottle of wine, some trail mix, box of tea, a few snack bars, and some candles. 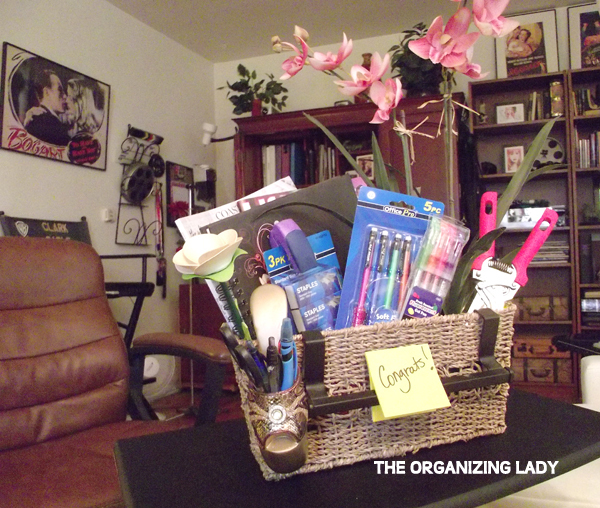 Going through my abundant office supply stash, I was able to toss in some pens, scissors, stapler with staples, note pads, notebook, and my very cool fancy high-heel-shoe-pen holder hanging outside the basket (clearly for a woman!). Okay, not a common type gift basket, but hey, I had the stuff lying around, so why not? Hey, it’s okay to Pin these photos to your Pinterest boards and share the love!